i Click 'view all' to instantly compare this ok deal with offers on other top movado watches for men. 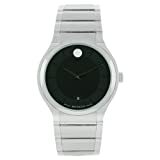 Movado Men's Core-Museum Classic 0607219 Stainless Steel One Size is currently selling at $463.01, approximately $3.35 higher than average, giving a potential saving of $20.97 right now. With a lowest price of $439.59 and an average of $459.66 it is selling on the high end of its usual range. Price volatility is 4.61% (meaning it changes a few times a week), so the price may drop reasonably soon. Right now this product is a recommended 'ok deal'. 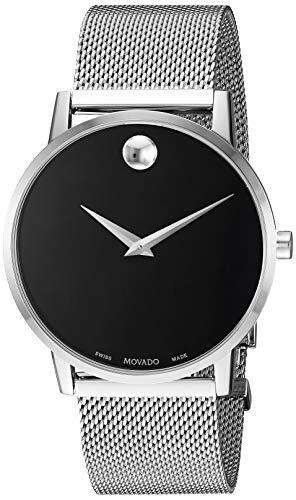 Compare the current price, savings (in dollars & percent) and Buy Ratings for the top Movado Watches For Men that are closely related to Movado Men's Core-Museum Classic 0607219 Stainless Steel One Size. 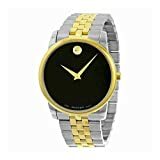 Here is how Movado Men's Core-Museum Classic 0607219 Stainless Steel One Size compares with other leading Movado Watches for Men. Checking the time never felt so right wearing the Movado® Core-Museum Classic. Stainless steel case. Stainless steel mesh bracelet with deployment clasp. Two-hand analog display with Swiss quartz movement. Black Museum dial with tone-on-tone outer ring and silver-toned dot. Sapphire crystal. Water resistant 3 ATM/30 meters. Made in Switzerland. Measurements: Case Height: 39 9?10 mm Case Width: 39 9?10 mm Case Depth: 6 9?10 mm Band Width: 20 3?5 mm Band Circumference/Length: 9 in Weight: 3.2 oz FeaturesChecking the time never felt so right wearing the Movado® Core-Museum Classic. Stainless steel case. Stainless steel mesh bracelet with deployment clasp. Two-hand analog display with Swiss quartz movement.